So far, it seems like 2019 is off to a roaring start — or is it? Equity markets and bond markets have been up year-to-date, many of them significantly. Still, it is hard to ignore the roller coaster that we endured in 2018. In fact, coming out of 2018, trend-following strategies had pivoted to a view in which "short is the new long." Many investors found 2018 markets challenging as they tried to determine whether things had changed for good. They often asked if V-shaped recoveries (or a swift drawdown immediately followed by a recovery period) in equities were the new normal, or if they should begin to expect more divergence in global markets. For trend-following managers who try to measure where markets are going using quantitative tools, this environment has not been easy. It is also not new. In fact, there are several times in history when we saw similar trends and positioning. As we often say, history does not necessarily repeat itself, but it certainly can rhyme. To trend-following managers who have recently found determining trend direction somewhat difficult, this period seemed strangely reminiscent of 2007. 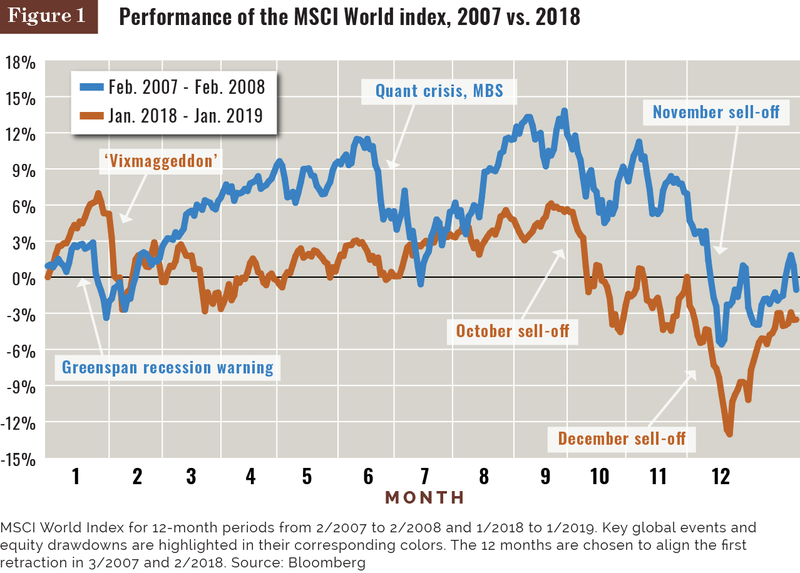 Figure 1 plots the MSCI World index for 12 months from February 2007 to February 2008 and for January 2018 to January 2019. In both of these 12-month periods, markets experienced significant retractions, although of course for different reasons. How does a quantitative strategy like trend following react to an environment like this? As global trends change, particularly when they reverse, trend-following strategies adjust their positions when markets move in new directions. In a year like 2007 or 2018, new trends may emerge and trend-following strategies may pivot their positions to follow emerging new trends. 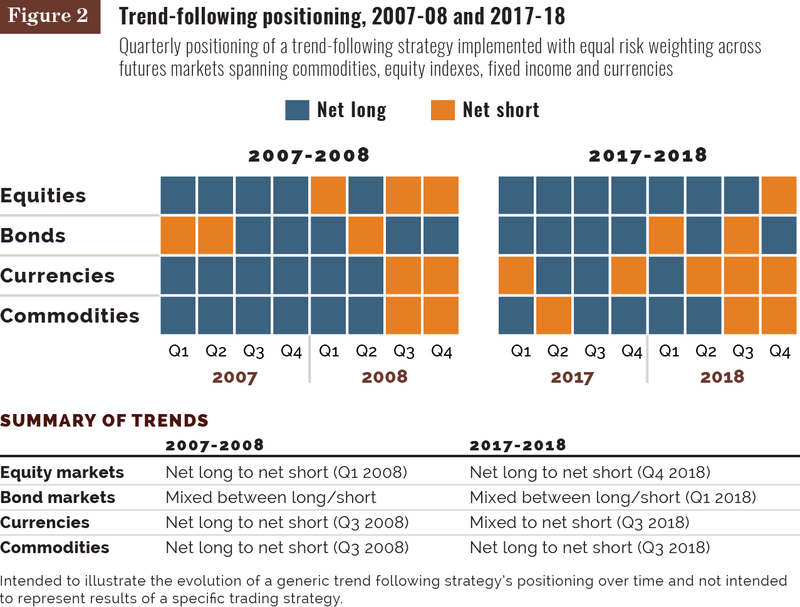 Figure 2 plots net long and short positioning of a generic trend-following strategy by asset class in 2007 and 2008 and 10 years later in 2017 and 2018. In both periods, trend-following strategies shifted to primarily short positions from primarily long positions across most asset classes. At the end of 2018, "short was the new long" for trend following, with net short positions in equities, currencies and commodities. From Figure 2, we can see that the reversal environment in 2007 and in 2018 was followed by shifts in positions in many asset classes, often to short from long. Are these two environments the same? Clearly not. However, there are some similarities. The reversal environment in both 2007 and 2018 was followed by shifts in many asset classes to short positions from long positions. As of December 2018, trend following was net short in currencies, commodities and equities. Similar to the second and third quarters of 2008, bond market positioning in the last two quarters of 2018 switched to net long from net short in response to equity drawdowns. Thus far in 2019, the jury is still out as bond and equity markets have rallied following a difficult December. The bearish view may seem unprecedented, but this type of positioning has occurred several times in history. To demonstrate this, Figure 3 plots the net long and short positioning by asset class quarterly since late 1990. Note that the fourth quarter of 2018 is one of the few periods in history with mostly net short positions. As we see in Figure 1, the beginning of 2019 shows a hint of recovery for equity markets. Despite this movement, some longer-term analytics might suggest investors not hold their breaths just yet. Given the recent period, perhaps this recovery is here to stay — perhaps it isn't. Although less pronounced than in December, trend signals are still showing relative weakness in equities, commodities and currencies, with a strong U.S. dollar after a difficult 2018. In a world where short is the new long, there is potential for markets to do something different. Going into 2019, trend-following strategies are positioned for potential change. Kathryn M. Kaminski is the chief research strategist at AlphaSimplex Group LLC, Cambridge, Mass. This content represents the views of the author. It was submitted and edited under Pensions & Investments guidelines, but is not a product of P&I's editorial team.